Joe Swanberg has been credited as a pioneer of the “mumblecore” movement, which is comprised of lower-budget films that often focus on largely improvised dialogue as opposed to a tightly crafted plot. While his new feature Win It All is more conventionally structured than previous efforts like Drinking Buddies and Happy Christmas, it still retains the hallmarks of the genre by keeping the scope of the story small and by making the dialogue naturalistic and believable. 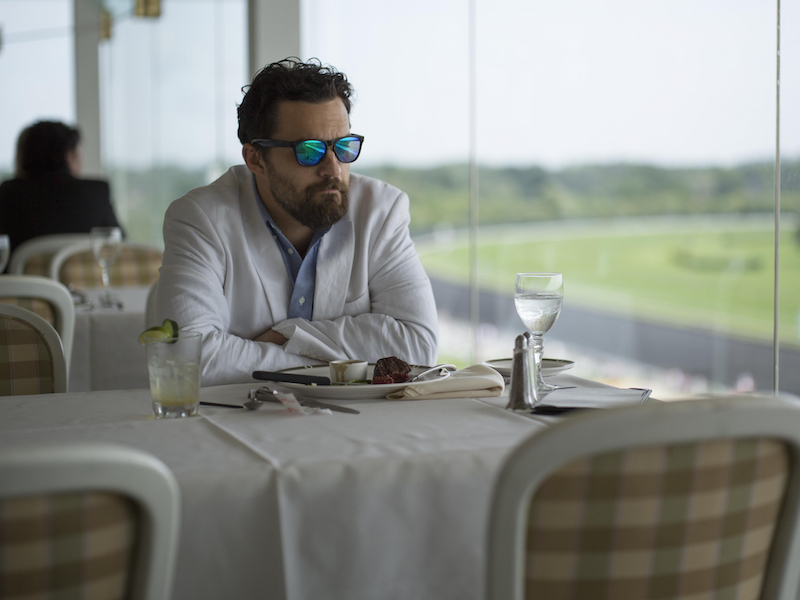 It also stars frequent Swanberg collaborator Jake Johnson (credited as co-writer and co-producer as well), who extends past his typical comedic range and turns in his most compelling performance to date. Johnson plays the down-on-his-luck gambling addict Eddie Garrett, who spends his days as a parking attendant at Wrigley Field and spends his nights lurking for any underground card games he can find around the city. He seems to catch a break when an acquaintance offers him $10,000 to look after a mysterious duffel bag, provided that Eddie doesn’t open the bag to peruse its contents, while he does jail time for the next 6 months. Going against orders, Eddie takes a look inside and finds $50,000 in cash, which sends his mind racing with how many different ways he can gamble it all away. After celebrating a successful night of blackjack, Eddie meets a single mother named Eva (Aislinn Derbez) and the two form a relationship that unfolds at a pace that seems leisurely for a wheeler-dealer type like Eddie. It shouldn’t be a surprise that the hilarious Keegan-Michael Key steals all of his scenes as Eddie’s Gamblers Anonymous mentor who doesn’t mince words when dispensing advice to his struggling confidant. Also filling out Eddie’s support system is his brother Ron (Joe Lo Truglio), who’s the head of his own landscaping company and begs Eddie to work for him in an effort to straighten out his path. Ultimately, the film’s focus is on Eddie and his unwavering compulsion to gamble away every last cent that he has; as another character puts it to him, he’s “addicted to losing”. Swanberg delivers this addiction with moments of lightheartedness but also with a palpable sense of the stakes at hand, which is made quite literal with a counter that appears intermittently in the bottom right corner which denotes Eddie’s monetary standing (if you hadn’t guessed, it’s frequently a negative number). Even though there are plot points and contrivances that will be familiar to anyone who’s seen a gambling movie like this before, the story has an emotional undercurrent of desperation and loneliness that’s undeniable. Credit to Jake Johnson for creating such an affable deadbeat who always seems like he’s on the edge of throwing away his life and running as far as he can from the problems he’s created for himself. There’s a constant anxiety and unease from his performance that made me feel on edge, along with an unending sorrow that comes across his face during every bad beat that he endures at the poker table. Indeed, there’s so much losing depicted in Win It All that it’s almost ironic how much of a winning formula Swanberg and Johnson have concocted with a movie that feels authentic and oddly endearing.